There is a surprising parallel between the philosophical concept of Nagarjuna and the physical concept of reality of quantum physics. The fundamental reality has no firm core but consists of systems of interacting objects. These concepts of reality are inconsistent with the substantial, subjective, holistic and instrumentalistic concepts of reality which are forming the base of modern modes of thought. Nagarjuna had been the most important Buddhist philosopher of India. According to Etienne Lamotte his lifetime was in the second part of the 3rd century after Christ. His philosophy is of topical interest. Till this day it determines the modes of thought of all Tibetan Buddhist traditions. About his life we have no assured knowledge but various legends which I won't go into detail about. But the authenticity of 13 of his works is assured by scientific research. The Dane Chr. Lindtner endeavored to analyze and to translate these 13 works. [Pratityasamutpada] the dependent arising is what we call [sunyata] substancelessness. But this is nothing but a dependent concept [prajnapti]. [sunyata] Substance-less-ness constitutes the middle way. In Europe, the substantial modes of thoughts are in the center of traditional metaphysics, beginning with pre-Socratic philosophers [like Parmenides and Heraclitus] and Plato, up to Immanuel Kant. According to traditional metaphysics, substance or own being is something immobile, eternal, independent, and existing by itself. Substance is the justification for the existence of all things, the immaterial foundation of the world we are living in. In traditional metaphysics the highest substance can be understood as God or as a divine being. Since Kant's so called 'Copernican revolution' the ambition of philosophy is not any longer to know things. Rationality as a media of cognition has become the ambition of philosophy and by that, the traditional metaphysic has lost ground in the modern world. The central concepts of traditional metaphysics like being, substance, reality etc. are replaced by reduced mindsets: From now on, atoms, elementary particles, energy, fields of force, laws of nature, symmetries, etc. are considered to be the justification of the existence for anything. By subjectivist modes of thought, I understand the turning point to the subject that had been introduced by Ren' Descartes. According to this doctrine, mind is the primary substance and everything else is nothing but contents, form or creation of consciousness. The height of this kind of subjectivism is described by the idealism of Berkeley. The ideas of Kant can be considered as a moderated subjectivism or idealism. Since Ren' Descartes, the primary substance is the center of modern philosophical thought. It give evidence and certainty. Modern sciences had doubts about this, however, these doubts did not lead to a new and complementary concept of reality but to a calamitous separation between philosophy and natural sciences. It has sharpened the dualism and keeps it very busy. The third approach tries to avoid the calamitous either-or-scheme of the first two approaches by consolidating both bodies, subject and object, into a whole. From now on, there are no longer parts but only one identity, all is one [Parmenides]. The whole is an absolute and mysterious one; it becomes an independent unity that exists independently from its parts. The ensemble is understood as something concrete as if it was a concept of experience. As a philosophical tenor of all great periods in European history of philosophy, this approach is connected with names like Aristotle, Thomas Aquinas, Leibniz, Schelling and perhaps Hegel. In quantum physics holism is represented by David Bohm. The 4th approach consists in a refusal or ignorance of the existence of subject and object. Instead of favoring one or the other or both ones, this metaphysical approach refuses both. The question about reality is insignificant or meaningless. Instrumentalism is very modern, intelligent [for example in the person of Ernst Cassirer], and sometimes captious. It is not easy to get free from it. It consists as a continuation of the so called 'Copernican turn' to consider thinking as thinking in models or as an information process, and it does not bother about which phenomena the information is given. That is a problem, instrumentalism has inherited from subjectivism. The philosopher Donald Davidson wrote about it: "If the decision for the Cartesian approach is made, it seems as if you are unable to indicate of which evidence your proofs are". Instrumentalism is a collective term of concepts. It denotes different scientific approaches that agree with considering all human knowledge or general conceptions, phrases, and theories not as a realistic reproduction of the structure of reality, but as a result of human interactions with nature. The successful theoretical and practical orientation is the aim of the interaction. For instrumentalism, theories are not a description of the world but an instrument for a systematic order and explanation of observations and predictions of facts. The instrumentalist approach is outlined by the physician Anton Zeilinger. Zeilinger states in an interview: "In classical physics we speak of a world of things that exists somewhere outside and we make a description of this nature. In quantum physics we have learned to be very careful. Ultimately physical sciences are not sciences of nature but sciences of statements about nature. Nature itself is always a construction of mind. Niels Bohr puts it like this: There is no world of quantum, there is only a quantum mechanical description". Things do not arise substantially: Neither out of themselves, nor out of something else, nor out of both, nor without a cause. Behind this scheme there are, as mentioned before, four extreme concepts of reality that can be related to substantial, subjective, holistic, and instrumentalist modes of thoughts. It is difficult to find a modern human being that does not agree to some extend with one of these 4 approaches. This shows that Nagarjuna's philosophy is up-to-date. Nagarjuna did not only decline (1) the substantial mode of thought in order to end up in (2) subjectivism, though it is often claimed against him. He did not decline the scheme of either-or modes of thought in order to end up at the approach of (3) holism, identity, or wholeness - how benevolent interpreters use to criticize him. He did not decline holism in order to end up at (4) instrumentalism, as assumed by many modern interpreters who succeed the philosopher Ludwig Wittgenstein. Why not?, because exactly these metaphysical concepts had systematically been declined by Nagarjuna. Already the first verse of the MMK points out not only the whole dilemma but the whole tetralemma of our modes of thought: "Neither from itself nor from another, nor from both, nor without a cause does anything whatever anywhere arises". [Garfield's translation]. This verse can be understood as the main statement of the lamadhyamaka-karika [MMK]: The refusal of four extreme metaphysical approaches that cannot agree upon the idea of the dependent existing of things. In this case the remaining of the MMK would be nothing but a commentary about this first verse. Therefore a careful examination is appropriate. "(That which has arisen dependently on this and that has not arisen substantially [svabhavatah].) What has not arisen substantially, how can it literally [nama] be called 'arisen'?. What originates due to a cause and does not abide without [certain] conditions but disappears when the conditions are absent, how can it be understood as 'to exist'?" By the concepts of 'emergence', 'arising' or 'existence' Nagarjuna has not meant the empiric but the substantial emergence, arising or existence. When in many passages of his book Mulamadhyamaka-karika [MMK 7.29] Nagarjuna tells that things do not arise, that they do not exist [MMK 3.7, MMK 5.8, MMK 14.6], that they are not to be found [MMK 2.25, MMK 9.11], that they are not [MMK 15.10], that they are unreal [MMK 13.1], the obvious meaning is: Things do not arise substantially, they do not exist out of themselves, their independence cannot be found and in this sense they are substantially unreal. Only the idea of substantial arising of things, only an absolute and independent existence, not the empirical existence of things is refused by Nagarjuna. He is explaining this in MMK 15.10 where he states: "'It exists' implies grasping after eternity: 'It does not exist' implies the philosophy of annihilation. Therefore, a discerning person should not decide on either existence or non-existence." For Nagarjuna the expression -to exist- has the meaning 'to exist substantially'. His issue is not the empirical existence of things but the metaphysical idea of a permanent duration and of a substance of circumstances: Only the idea of an own being, without participation to something else, is disapproved by Nagarjuna. Objects do not arise out of themselves, they do not exist absolutely, their permanent being is not to be found, they are not independent but they are dependently arising. If many interpretations make the assertion that Nagarjuna is refusing the empirical existence of objects, they make an inadmissible generalization that moves Nagarjuna near to subjectivism, nihilism or instrumentalism. Such interpretations originate from metaphysical approaches that have difficulties to recognize the empirical existence of objects in the world we are living in. That does not at all apply to Nagarjuna. How does Nagarjuna prove the dependent arising of things? The starting point of the MMK is the duality of things, their double-side-nature. These fundamental two-body-systems cannot be taken apart; they constitute a system of two material or immaterial components that complement each other. One component does not exist without the other one; one forms the counterpart to the other one. In the MMK, Nagarjuna is dealing with such concrete two-body-systems as for instance: a thing and its conditions, a walking person and the way to be walked, a seeing person and the seen object, cause and effect, existence and its characteristics, a passion and a passionate person, arising and conditions of arising, actor and action, fire an fuel. In this way, we are conducted to the centre of Nagarjuna's philosophy that consists in his concept of reality. In the just mentioned first ten chapters of his Mulamadhyamaka-karika [MMK], but also in the other chapters, Nagarjuna highlights mainly one single idea: Both, material or immaterial bodies of a two-body-system are not one identical but they do not break up into parts. The most important characteristic of a thing is its dependence of others and the absence of substance that results from it, the impossibility to exist individually and independently. This is the meaning of sunyata: things are without an own being and without independence, the fundamental reality does not consists of single, isolated material or immaterial components, things arise only in dependence of other things, they do not arise substantially because an independent thing cannot be dependent. A thing is not independent of the conditions and a thing and its conditions are not one. A walking person does not exist without the way to be walked and both are not one. A seeing person is not identical with the seen object. There is no cause without an effect and vice versa. The concept 'cause' has no meaning without the counterpart: the concept of an 'effect'. Both, cause and effect are not one but they do not break up into two independent and separated concepts. Without a characteristic we cannot speak about an existence and vice versa. How could there be a passionate person without passion? When there are no conditions of arising there is no arising, none of it is existing out of itself, and none is subsisting through itself. Without an action there is no actor, without fuel there is no fire. The components of a two-body-system do not exist by themselves, they are not one and they are not independent from each other, therefore they are not 'real'. For such two bodies and for double concepts the consistence and the existence are dependent of the other component. One arises with the other one and one disappears just as the other. That is why a thing arises substantially, neither out of itself, nor out of another one, nor out of both, nor without a cause. The fundamental reality has no firm core but consists of systems of interacting bodies. This concept of reality is initially an idea; only a reference to the reality that cannot be described with words. Whoever can speak about reality as it is, without concepts, does not know the reality. 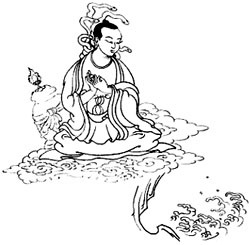 Referring to Nagarjuna, the yogic realization of reality without substance, the realization of dependent arising, the experience of reality as it is, requires for the Buddhist tradition a high spiritual realization; it requires giving up extreme approaches, the dissolution of the whole dualistic modes of thought. It is initially the dichotomous mode of thought, our way to think in dualistic contradictions, which hinders us to realize reality as it is. To realize sunyata means to become free from all entanglements to this world. Nirvana simply is another word for this. The first question for the philosophy of Nagarjuna was about reality, it was not the question about mind or about the origin of knowledge. This kind of subjectivism might apply rather to the philosophical school of Yogacara. But the interpretations of the most important works of Yogacara are controversial because they can be understood in an ontological sense that is denying the external world and is adopting the view of idealism or in an epistemic sense for the study of the nature of knowledge where perception is a projection of mind. What is named in Yogacara 'alayavijna', the fundamental mind, or in Tantric Buddhism 'clear light' or 'Mahamudra' is referring to the knowledge of reality, not to reality itself. Nagarjuna's philosophy is referring to reality itself. An all embracing position of this question is presented by Tarab Tulku Rinpoche in 2003. He says: "So we can call this basic 'energy' for a fundamental underlying 'mind-field'. This means, in accordance with Ancient Inner Science that everything existing partakes in a fundamental 'mind-field', which is the basic 'substance' from which basis mind in a more individual way and the individual body develop". In order to show that Nagarjuna does not speak just about concepts without substance but also about objects without substance, I compare his concept of reality to the physical concept of reality in quantum physics. Physics is not only about concepts but also about the conditions of physical reality. Directly physics creates nothing but models of reality, it examines only realities that are created by human mind but we should not go so far to consider all our perceptions and models of thought to be pure coincidence. The constructions of our mind are not directly identical with reality but normally they are no pure coincidence and not deceptive (Irvin Rock). Behind our models are empirical objects and approximately there is a structural similarity between a good physical model and the physical reality that corresponds to it. This is no presentation or criticism of quantum physics but a discussion of the metaphysical mindsets that underlie quantum physics. The concept of reality in quantum physics can be expressed by the key words: complementarity, four interactions, and entanglements [entanglements will not be explained in this paper. According to Roger Penrose "Quantum entanglement is a very strange type of thing. It is somewhere between objects being separate and being in communication with each other" (Roger Penrose, The Large, the Small and the Human Mind, Cambridge University Press 2000, p.66)]. In the long prehistory of Quantum Physics it could not be proved experimentally whether the smallest elements of light are particles or waves. Many experiments argued in favor of one or the other assumption. Photons are sometimes acting as waves and sometimes as particles. This behavior was named a wave-particle-dualism. The idea of dualism used to be understood as a logic contradiction: only one or the other could apply but paradoxically both appeared. Photons cannot be both. These are the expectations according to atomism. According to atomism a scientific explanation consists in a reduction of a contradictory object into its permanent components or its mathematical laws. This is the fundamental dualistic concept that modern atomism and modern physics have adopted from ancient Greek philosophy of nature: substance and permanence can not to be found in objects of perception in the world we are living in, but in the elementary elements of objects and in mathematical order. These material and immaterial foundations keep the world together; they do not change while everything else is changing. According to atomism it should be possible to reduce an object to its independent elements or to its mathematical laws or to its simple and fundamental principles and according to these the fundamental elements should be either particles or waves, not both. What is to be understood by independent elements? Plato made the difference between two forms of being. In the second part of his 'Parmenides' he distinguished between single objects, which exist exclusively by partaking and insofar they have no own being and ideas, that have an own being. Traditional metaphysics adopted this dualism from Plato. An independent own being is characterized in traditional metaphysics as something that, as an existing thing, is not dependent from anything else (Descartes), existing by itself, subsisting through itself (More), which is completely unlimited by others and free from any kind of foreign command (Spinoza), and exists by itself without anything else (Schelling). Albert Einstein was following this metaphysical tradition when he wrote: For the classification of things that are introduced in physics, it is essential that these things require for a certain time an independent existence, as far as these things lay 'in different parts of space'. Without the assumption of such an independent existence [of 'So-seins' as Einstein called it, this expression can be translated by a word like 'likeness' or 'to be like this'] of things being distant from each other in space, physical thought in the usual sense would not be possible. This idea of an independent reality was projected to the fundamental elements of the material world by atomism. For atomism, a scientific explanation means to reduce the vicissitude and variety of objects and conditions to its permanent, stable, independent, undividable elements, or mathematical laws. According to the expectations of atomism all changes of nature can be explained as separation, connection and movements of unchanged and independent atoms or still more elementary components. They and their mathematical laws are the core or fundamental reality of objects. They keep the world together. The question whether the fundamental objects are particles or waves was an explosive issue: the traditional concepts of reality, that had been made available by metaphysics, were at stake. Maybe the fundamental reality could not be grasped by traditional concepts of reality. Of which value of explanation was atomism, if it should turn out that there are no independent atoms or elementary particles and that objects have no stable core? Are quantum objects objective, subjective, both, or none of both? What is reality? Is there a difference between the quantum world and the world we are living in? Niels Bohr. In 1927, the physicist Niels Bohr introduced the concept of complementarity into quantum physics. According to this concept the picture of wave and the picture of particle are not two pictures that contradict and exclude each other but two (contradictory) pictures that complete each other, only concertedly they can give a complete description of physical phenomena. According to Bohr, complementarity meant that in the quantum world it is impossible to speak about independent and objective quantum objects because they are in an interactive relation with each other, as well as with the instrument of measurement. Bohr considered the interaction between the object and the instrument of measurement as an inseparable element of quantum objects, because the interaction itself is important for the existence of some features of these objects: some measurements set photons as particles and destruct the interference that characterizes objects as waves. Other measurements set objects as waves. That was the new concept of reality by Niels Bohr. Bohr did not transform the concept of complementarity into the instrumentalist conclusion: there were no quantum objects [at least when his argumentation was one of a physician's view. However, when he talked on a metaphysical level about quantum physics, he took the position of an instrumentalist approach]. In a physical sense the fundamental physical reality consists for Niels Bohr of interacting complementary quantum objects. Interaction in the standard quantum model. In the meantime the concept of the four interactions was introduced to the standard quantum model. These four elementary interactions do not permit the reduction of quantum objects to their elements as Democritus proposed. Interactions, the forces that act between the quantum objects, cropped up to the elementary particles. As elementary objects, not single independent objects were being established, but two-body-systems, multi-body-systems or complete assembles of elementary particles. Between its components, forces of interaction are effective which keep the components together. They are parts of the components. Mostly they are forces of attraction. In the case of electro-magnetic forces they are also repulsive. It is possible to think of the interactions between the elementary particles as an exchange of elementary particles. The physicist Steven Weinberg writes about this: "Today we come within reach of a standardized view of nature, if we think in concepts of elementary particles and interactions between them. (...) Best known are gravitation and electro-magnetism that belong to the daily world of experience because of their range. Gravitation keeps our feet on earth and planets on their path. The electro-magnetic interactions between electrons and atomic nucleus are responsible for all well known chemical and physical qualities of usual solid bodies, liquids, and gases. The two nucleus powers belong to a different category in respect to reach and familiarity. The 'strong' interaction that keeps protons and neutrons inside the nucleus together has a reach of about 10-13 centimeters. So it goes down in daily life and even in the realm of an atom [10-8 centimeters]. The 'weak' interaction is the least familiar. It has such a short reach [less that 10-15 centimeters] and is so weak, that it probably does not keep anything together". Sometimes explanations go very far into difficult and subtle details. How does an electron interact with another quantum object if it exists of one part only? Which part it should emit if it exists of one part only? There is an answer to these questions by the concept of interactions. An electron does not exist of one single part only, because the interaction is a part of the electron. In an article about super gravitation of 1978 the two physicians Daniel Z. Freedman and Pieter von Nieuwenhuizen write about it: "The observed mass of electrons can be described as the sum of a 'naked mass' and the 'self-energy' that is based on the interaction of the electron with its own electro-magnetic field. Individually none of these parts are observable". The knowledge of quantum physics about the particles that carry the interactions, shall be mentioned here in the words of the physicist Gerhard't Hooft. He writes, "that an electron is surrounded by a cloud of virtual particles, which are permanently emitted and absorbed. This cloud does not exist of photons only, but of pairs of charged particles, for example electrons and their anti-particles, the positrons. (...) "Even a quark is surrounded by a cloud of gluons and pairs of quark-anti-quark." Individual, isolated, independent quarks were never been observed. This phenomenon is named confinement. This means quarks are captives, they cannot appear as a single quark but as a pair or a trio only. If you try to separate quarks by force, there will appear new quarks between them, which unify into pairs and trios. Claudio Rebbi and other physicists reported: "Between quarks and gluons inside an elementary particle, permanently additional quarks and gluons appear which disappear again after a short time". These clouds of virtual particles represent or produce interactions. We now arrived at the centre of quantum physics. It consists of a new physical concept of reality, that does no more consider single and independent elements as the fundamental reality but two-body-systems or two states of quantum objects or two concepts like earth & moon, proton & electron, proton & neutron, quark & anti-quark, wave & instrument of measurement, particle & instrument of measurement, twin photons, superposition, spin-up & spin-down, matter & anti-matter, elementary particle & field of force, law of nature & matter, symmetry & anti-symmetry etc. These systems do not break up into independent parts. They cannot be reduced into two separated independent bodies or states with one part being fundamental and the other one deduced, as it is the case with substantialism's and subjectivism's either-or-scheme. Together they are not a mysterious unity, they are not 'one' and identical as holism tries to convince us. Furthermore, we cannot claim that they are nothing but constructed mathematical models and that no physical reality corresponds to them, what has been claimed by instrumentalism. Exactly the latter is claimed by Stephen Hawking who does not consider himself as an instrumentalist but as a positivist. In a discussion with the mathematician Roger Penrose, Hawking said: "I am a positivist who believes that physical theories are just mathematical models we construct; and that it is meaningless to ask if they correspond to reality, just whether they predict observations". It is not meaningless to ask for the correspondence between model & object. If a model of thought is accurate it has a structural similarity with the phenomenon that it constructs, otherwise it can lead to calculations without any meaningful physical explanation, because they cannot correspond to any reality. Physically, Physically, a fundamental reality is not a one-body-system but a two-body-system or an assemble of bodies that surrounds the central or the 'naked' body. Between quantum particles there is an interaction that is part of these particles. That's the way it is but all our metaphysical schemes put up a real struggle. This 'cloud' does not correspond to our traditional metaphysical expectation of everything that should represent order and should be fundamental. How can 'clouds' be that which we are used to call the basic elements of matter? How can this little vibrating thing be what generations of philosophers and physicists were looking for? Is this supposed to be all? From the little 'cloud' we try to filter with metaphysical interpretations what has substance and what maintains. Completely for the purpose of Plato's substance metaphysics Werner Heisenberg called elementary particles 'the idea of matter'. The philosopher and physicist Carl Friedrich von Weizs'cker named mathematics 'the essence of nature'. According to the physicist Herwig Schopper, fields of force are the ultimate reality. Some of us like to consider the fundamental reality as a whole [holism] and according to others all is nothing but a construction and no reality correspond to this construction [instrumentalism]. Why all these extreme metaphysical positions? Just because we cannot easily admit that complex interactions of the world we are living in, have a foundation that is a complex reality by itself. It is impossible to get out of the entanglement of this world by quantum physics. It is impossible to find an elemental quantum object that is independent from other quantum objects or from its own parts. It is impossible to dissolve the double-sided character of quantum objects. The fundamental physical reality consists of 'clouds' of interacting quantum objects. 4. Results. Reality is nothing static, firm or independent. It does not consist of single, isolated material or immaterial factors, but of systems of dependent bodies. Most of the systems consist of more than two bodies but there are no systems that consist of less than those two bodies. In quantum physics we call such fundamental two-body-systems earth & moon, electron & positron, quark & anti-quark, elementary particle & field of force. his systems walking person & way to be walked, fire & fuel, action & actor, seer & object of seeing. Both of these models describe two body-systems which have objects that are separate and at the same time in communication with each other. They are neither identical with each other, nor do they break up into parts. The bodies are not independent and individually none of these parts are observable because in their state of existence they are dependent from each other and cannot exist independently. They are entangled by interactions, even in a far distance. One body cannot be reduced to the other. The systems have a fragile stability that is based upon four well known, sometimes not completely known and sometimes completely unknown interactions [in the case of entangled and separated photons] and mutual dependencies of their components. What is reality? We are used to being on our feet on terra firma and to see fugacious clouds in the sky. The concept of reality in the philosophy of Nagarjuna and the physical concepts of complementarities and interactions in quantum physics, tell us something different that could be expressed as follows: all is build upon sand and even not the grains of sand have a solid core or nucleus. Their stability is based on instable interactions of their components. (3) Donald Davidson, Der Mythos des Subjektiven, Stuttgart 1933, p. 90. English: The Myth of the Subjective. (8) Niels Bohr, Collected Works, Volume 6, North-Holland, Amsterdam, New York, Oxford, Tokyo 1985, p. 103: "I do not know what quantum mechanic is. I think we are dealing with some mathematical methods which are adequate for description of our experiments"(1927). Are you sure "inconsistent" is what you meant in the abstract paragraph?